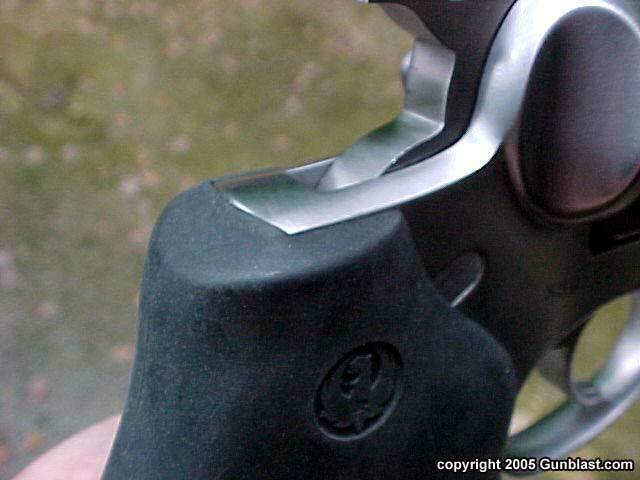 Ruger's Super Redhawk revolver has been around for about eighteen years now, and enjoys a reputation for strength, durability, and accuracy in a double-action sixgun. It also has a well-earned reputation as a pretty big revolver. One word that never comes to mind with the Super Redhawk is "petite". 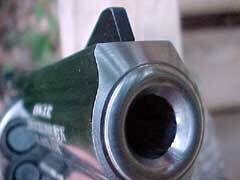 It is a big revolver built for hunting, a role in which it serves well as a primary hunting tool. 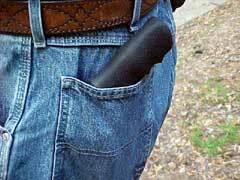 It is not a weapon that one would likely choose to carry as a backup to another primary weapon such as a rifle. For its intended purpose, it does a stellar job of fulfilling that role. It is a hunting gun. 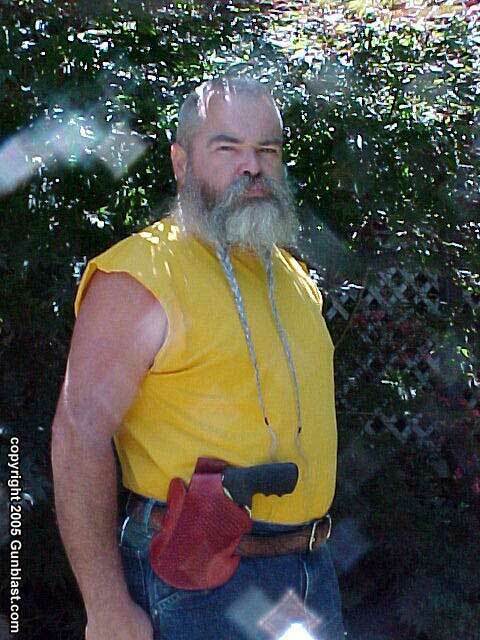 Personally, I am a single-action man. 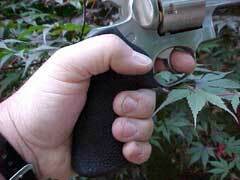 I find that the single-action revolver is more compact, and a simpler design. 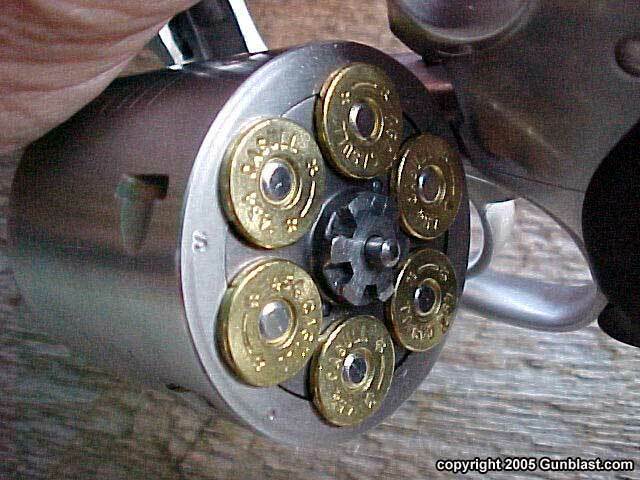 I like my belt guns to be relatively portable, and never considered the Super Redhawk to be an easily packable sixgun. 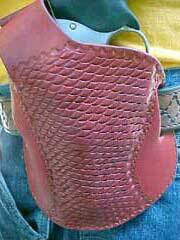 It is perfectly suited to carrying in the hand or slung across the chest while hunting, but I find it too big to carry in a belt holster while walking through the woods. Again, for a primary hunting gun, it is just great, but it is a design for which I never personally found a burning desire to own. 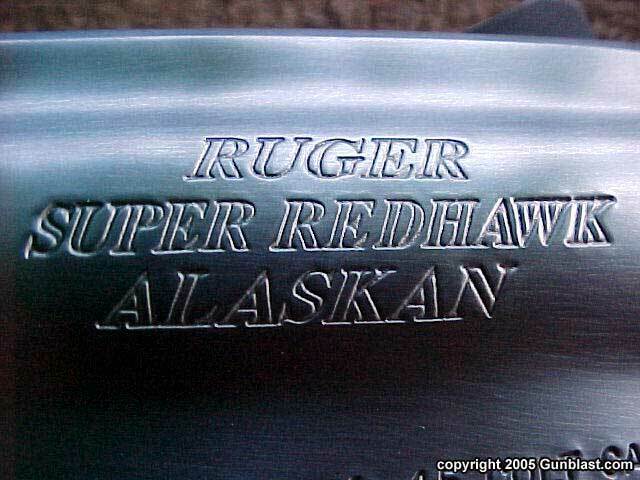 Now, Ruger has taken that excellent design, chopped five inches off the barrel, added a very comfortable Hogue grip, and turned the Super Redhawk into a relatively handy little big bore belt gun that they call the "Alaskan". 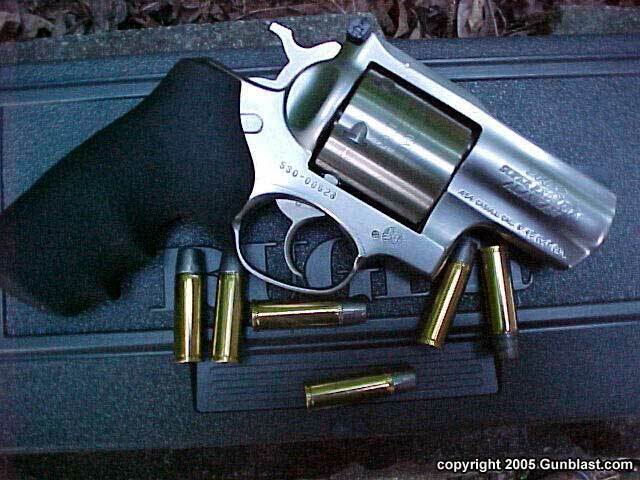 Chambered at first for the healthy .454 Casull cartridge, the .480 Ruger version is to follow shortly. 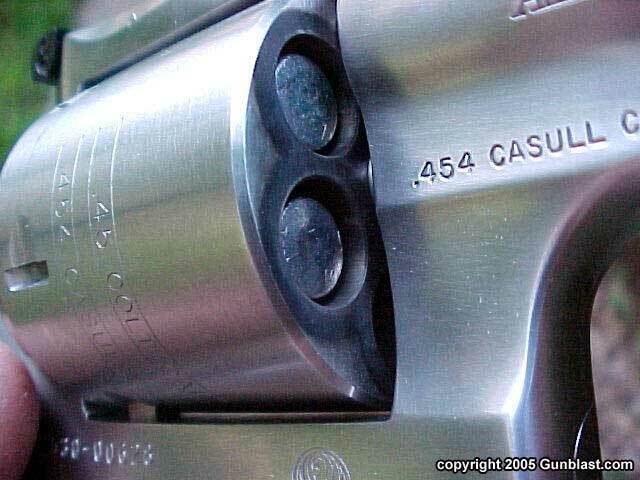 The .454 Casull will also fire the .45 Colt cartridge interchangeably, making it a very versatile chambering, and is the one received here for this review. Look for a review on the .480 as soon as a production gun arrives. While the Alaskan is still a big sixgun, it is much more packable than its full-sized brother. The Alaskan wears a barrel that measures just 2.58 inches in length on the test gun, which really dramatically changes the balance and handling qualities of the design. What I once found to be a bulky sixgun for which I cared little, has become an interesting belt gun. The Alaskan was built to be the ultimate back-up gun for those who hike, fish, camp, or hunt in big bear country, hence the name "Alaskan". In fact, I hear that the gun is already quite popular up north in our forty-ninth state, with the first shipments sent there. As a heavy-duty self defense gun against large beasts, the Alaskan makes good sense. It would also serve well those who work with large animals, such as domestic cattle. A big bull can really hurt a man quickly. The Super Redhawk design is a very strong and rugged one, with front and rear cylinder lockup, offset cylinder bolt notches, and a solid frame design. It can handle a steady diet of .454 Casull ammunition without shooting loose. The .454 Casull cartridge offers plenty of power and deep penetration with the right choice of ammo. While the .454 will drive relatively lightweight bullets to high velocities with flat trajectories, the heavy weight bullets better fulfill the role intended for the Alaskan. The ability of the gun to fire heavy, bone-breaking bullets from a compact, portable package is what the Alaskan is all about. While it could serve well as a primary hunting weapon, in many places it would be illegal for big game hunting due to its short barrel length. However, there is no barrel restriction on self defense, whether it be for protection from wild animals or felonious thugs. The Alaskan carries six rounds of .454 power in the smallest package that I know of on the market. It weighs in at just 43.2 ounces, making it almost a pound lighter than the S&W 500 with its three inch barrel plus one inch of compensator. 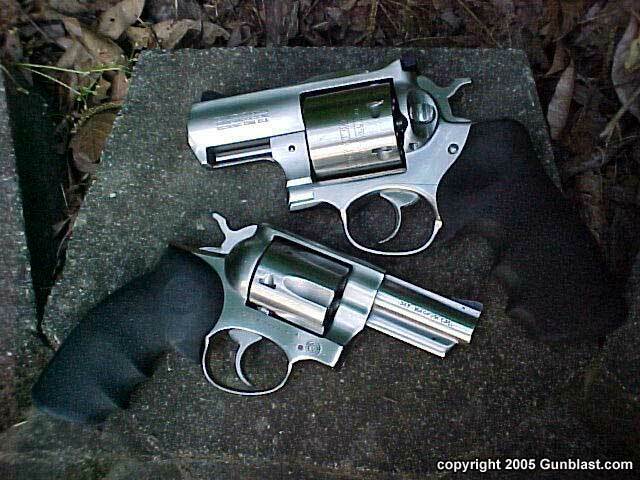 The Alaskan is one-half pound lighter than the Taurus two and one-quarter inch .454 Casull. 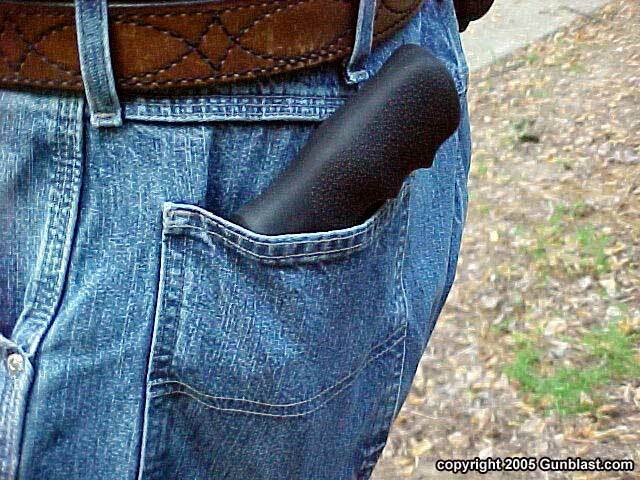 While the Alaskan is not a pocket pistol, I did carry it around for a while in my rear hip pocket while awaiting the arrival of the excellent Simply Rugged Pancake holster. These holsters are hand made by Rob Leahy up in Alaska, and are perfectly suited for carrying the Ruger Alaskan. 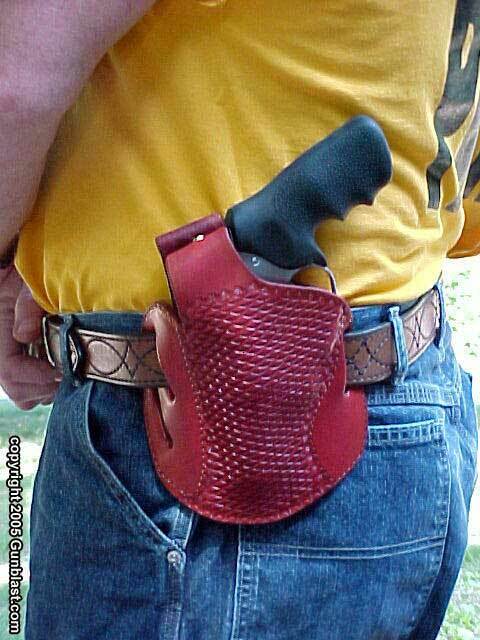 Rob’s holster works either as a cross draw or as a strong side hip holster, and makes the Alaskan comfortable to carry, yet readily available. It even conceals well under a light jacket. 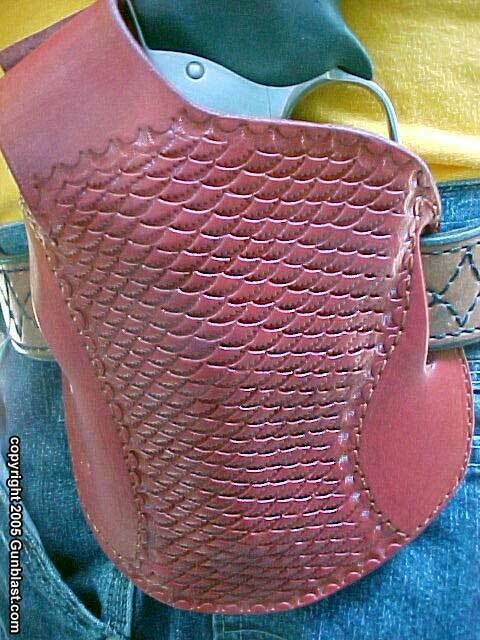 This holster is beautifully crafted with a shark skin tooled finish. As was expected, recoil was stiff with the heaviest loads, but the Hogue grip on the Alaskan was designed especially for this gun, and does a superb job of protecting the shooter’s hand. The gun does not "bite" the hand at all, even in the web between the thumb and forefinger. It is not painful to shoot. 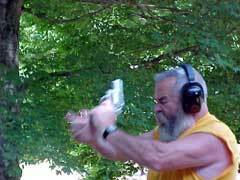 While with the heaviest .454 loads it was sometimes difficult to keep my supporting hand locked onto the gun, the Hogue grip made it easy for my strong hand to hang on firmly during recoil. 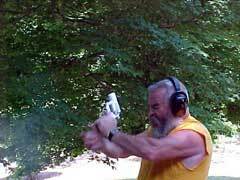 With .45 Colt ammunition, the recoil was indeed pleasant. The double-action pull measured a smooth but slightly heavy ten and one-quarter pounds, and the crisp single-action pull released at five pounds and two ounces. I was interested to see how much velocity would be lost due to the short barrel. 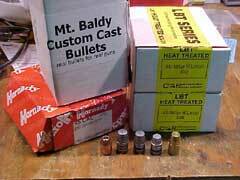 I tested a variety of factory ammunition and a few handloads, with the results listed below. All firing was done over the eyes of my PACT chronograph with an air temperature of just under eighty degrees Fahrenheit. Velocities are listed in feet-per-second (fps). 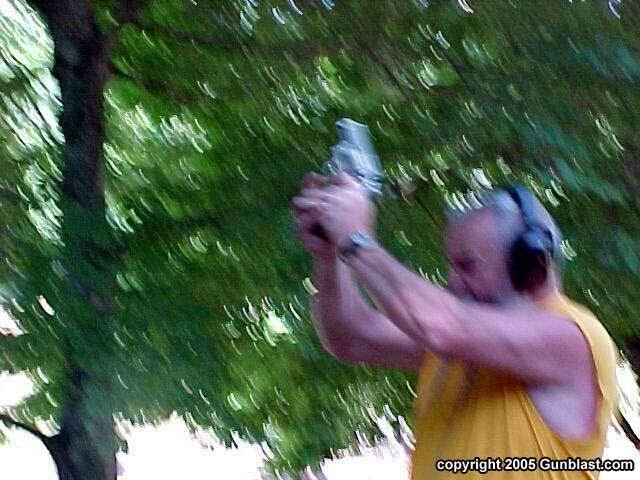 From my chronograph results it can be determined that the short barrel costs a bit of velocity loss, as little as about 200 feet-per-second to as much as 350 fps compared to a seven and one-half inch barrel as previously tested. 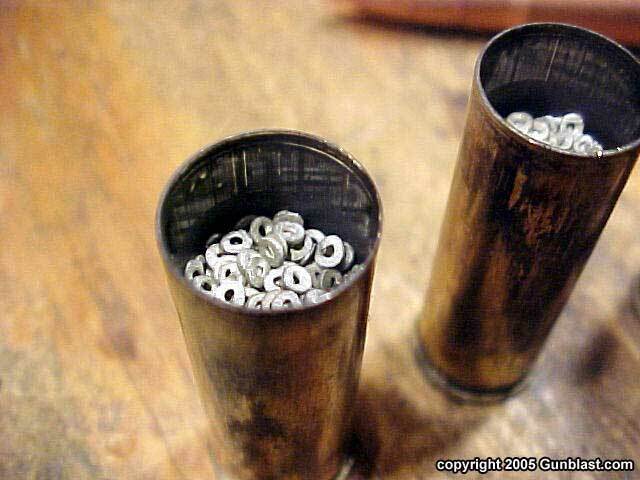 However, these huge hard bullets such as the Cast Performance and Belt Mountain slugs used in the handloads and their equivalents used in the factory ammo penetrate very well even at these lower velocities. For a moderate yet powerful handload for practice or whitetail and hog hunting, I got excellent results from the new Trail Boss powder from IMR. I do want to stress that IMR has not tested these loads, and recommends none for the .454 Casull using this powder, so I am not recommending these loads, only reporting the results that I obtained, which were superb uniformity and accuracy. 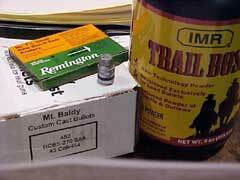 The load using 10 grains of Trail Boss and the 270 grain Mt. Baldy SAA bullet resulted in the most uniform velocities that I have ever recorded in chronographing ammunition for the past 21 years. With a average velocity of 1002 fps, the extreme spread was only 5 fps, with an average deviation of only 1.3! I cannot imagine better results. All handloads were assembled in Starline cases using Remington 7 ½ primers. The barrel on this Alaskan has one of the smoothest interiors of any handgun barrel that I have ever seen from Ruger, and fouling was not a problem at all. The chambers were also well-finished. All cases extracted easily, even from the heaviest loads tested. Accuracy was very good with the Alaskan. I could keep six rounds inside of two inches at twenty-five yards, resting my wrists over a rail. 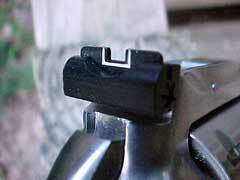 The short sight radius made it harder to hit than with a longer barrel, but with the Mt. Baldy bullets loaded over Trail Boss, I could get the gun to group into one and three-quarters inches at twenty-five yards. If you are standing in the path of a large bear, wild boar, or even a mean bull, that is much more accuracy than you can use. While the Super Redhawk has always been a strong but somewhat bulky revolver, The Alaskan is in a whole different category. It balances power with portability, strength with handiness, and puts bone-crushing penetration into a very packable sixgun. I like it. To purchase one of the holsters pictured here, go to: www.simplyrugged.com. 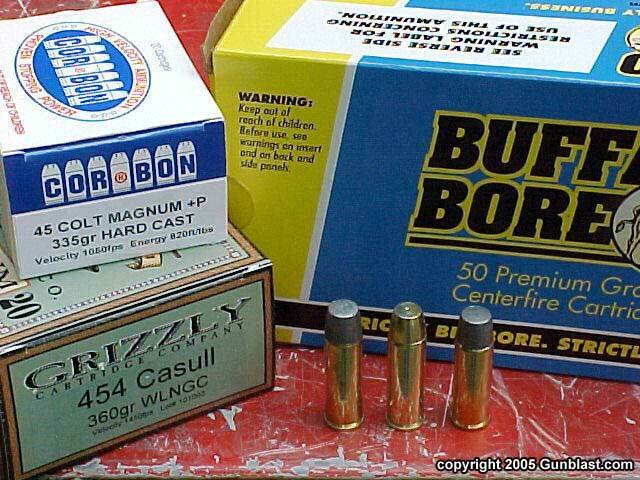 For the ammo and components listed above, go to their respective websites: www.buffalobore.com, www.grizzlycartridge.com, www.cor-bon.com, www.castperformance.com, www.mtbaldybullets.com, and www.beltmountain.com. Author fires the new Ruger Super Redhawk Alaskan with various loads. 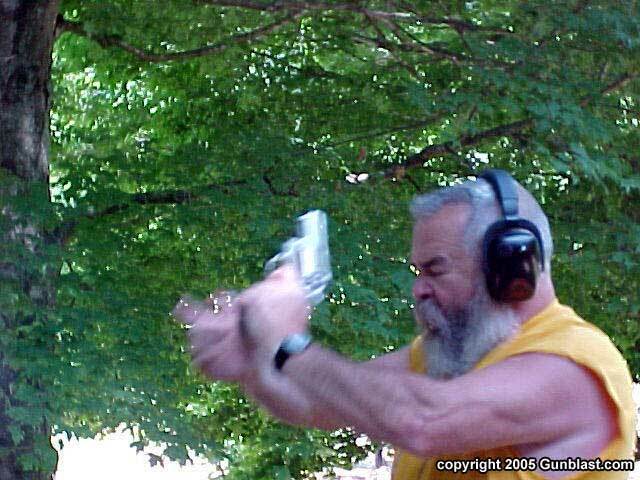 While recoil with full-power .454 loads was stiff, the Alaskan proved to be controllable with all loads fired. 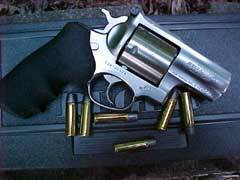 Using lighter .454 loads and moderate-to-heavy .45 Colt loads, the Alaskan was downright pleasant to shoot. Ruger's cushioned rubber grips go a long way in helping tame the effects of recoil with the .454 Alaskan. 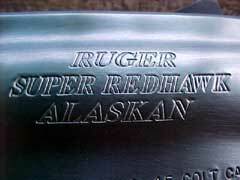 The folks at Ruger have really cut the Super Redhawk down to size with the Alaskan version. 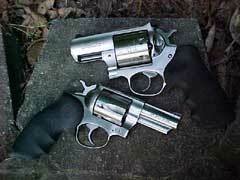 The Alaskan (top) is not that much larger than Ruger's classic Service Six .357 service revolver (bottom). While not a pocket revolver by any means, the Super Redhawk Alaskan can be comfortably carried in a hip pocket. Rob Leahy of Simply Rugged makes a nice and practical holster for the Alaskan. This thumb break holster can be worn either crossdraw or strong-side, and is a viable concealed carry holster for the big sixgun. 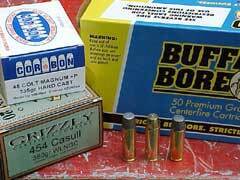 Author tested the Alaskan with a good variety of factory loads, including offerings from Cor-Bon, Buffalo Bore and Grizzly Cartridge Co. The combination of Mt. 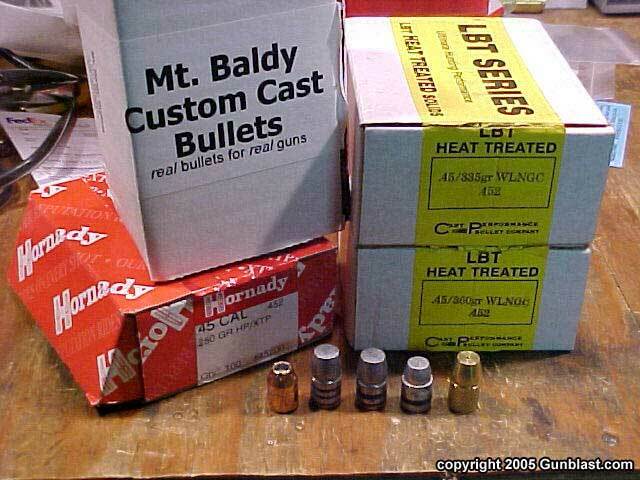 Baldy's cast bullets and IMR Trail Boss powder yielded some of the most accurate and consistent ammo Jeff has ever shot over a chronograph. Author has always appreciated the original Super Redhawk, even if it was never a gun he had a burning desire to own. The Super Redhawk Alaskan is a different animal, offering bone-crushing power in a handy, controllable package. The folks at Ruger have done it again!